Who says you can’t live downtown and still enjoy big blue skies and al fresco activities? Though Yonge + Rich condos, developed by Great Gulf, will be at the epicentre of downtown Toronto, the building’s commanding views, ample balconies and landscaped terraces will give urban homeowners a much needed breath of fresh air. Suites in the fifty-storey tower will go on the market this spring and the sales centre is due to open April 2013. Designed by architectsAlliance with interiors by Burdifilek, the entire project emphasizes natural light and outdoor space. The units were laid out in a manner that would ensure as much window exposure as possible. And the terraces will be generously-sized as well. 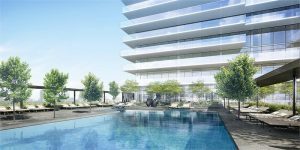 Located at 25 Richmond St. E., just one block from Yonge, the building is south enough that residents will be able to enjoy great views of the lake. Other exposures will get the full advantage of the city’s expansive skyline. And with the Financial District, Dundas Square, the Eaton Centre, Ryerson University and the Underground PATH system all just steps away, it’s no wonder the development earned an impressive walk score of 98. Commuters will surely appreciate the development’s perfect transit score of 100. Not only is it close to subway and streetcar lines, major highways are close by too. With Yonge + Rich condos, you won’t have to choose between the exciting energy of the city’s core and the calm that comes with watching the sun set from the comfort of your patio chair. Most suites are one and two bedrooms and within the range of 500 to 926-square feet. Prices start at $289,990. For more information check out yongeandrich.com.